Our adorable cube vase features everything babies love: bright colors, cute animals and a healthy dose of whimsy. 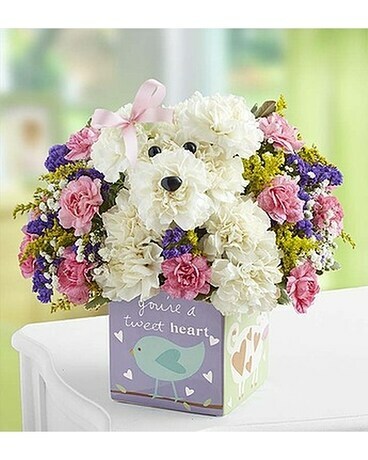 Inside is our a-DOG-able arrangement, surrounded by a fun and colorful mix of even more flowers—perfect for reminding the lucky parents to “paws” and enjoy their new child! The cube can later be reused to hold a variety of items: cookies, candy, cotton balls... or whatever Mom and Dad will need at hand on the changing table!